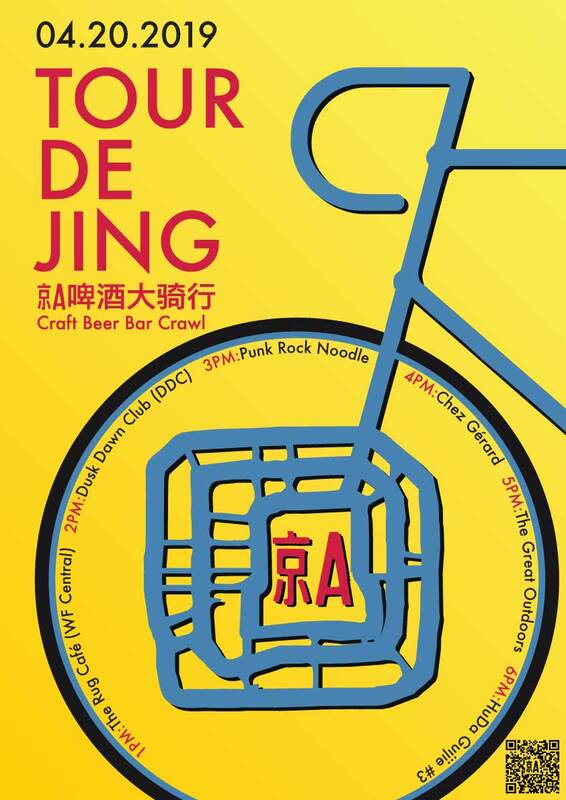 The annual Tour de Jing returns on Saturday, April 20th! This is an all-time favorite in our event calendar, celebrating the arrival of Spring with a pub crawl on wheels. The mission is simple: hop on a bike, tricycle, or scooter and follow the group on a cheerful migration through the hutongs. Each location will have a different 京A brew on tap for 25RMB during our hour-long stop there on the tour. Collect a stamp at each stop when you buy a beer, and if you have collect all six at the end you'll get a 京A bottle koozie to take home! This year we'll be starting at 1PM at the huge outdoor terrace of The Rug Cafe (WF Central). Get there with a head-start to order brunch and your first beer will be on us! After that, we'll roll north up tree-lined Beiheyan street to make our way through the remaining five stops! Each bar or restaurant we're visiting will have a roof terrace, courtyard, or easy hutong street chillin' so you can spend the whole day developing your biker's tan.